BLAIRS Stainless-steel Multistage Water Pump is an equipment to achieve the right water resource/pressure. The automatic pressure systems are designed to automatically start and stop the pump on opening and closing of taps. 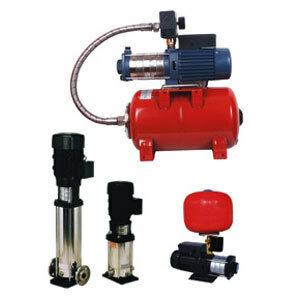 Pressure booster Pump is coupled with a Compact designed composed pump, a manometer, a Pressure diaphragm tank, a pressure adjustable switch, dry running protector and a 3 or 5 ways connection in stamped brass. These pumps should be installed in a covered area, protected against the weather. They are very silent and reliable. BLAIRS Stainless steel Multistage Water Pump is designed with advanced features such as the leakage-free design and fully stainless steel materials for rust-free operation without affecting your water quality. These pumps provide silent, strong & comfortable for water pressure all the time. They assure you the best water pumping performance for your applications, higher in efficiency and easy to operate Stainless-steel multistage water pumps. Featured with flat curves and construction in SS assures safe drinking water. Design of the multistage water pump with high accuracy allows high head with lower motor capacity, which is ideally used for all high-pressure applications. The most exceptional merit of these SS Pumps is that it's all wetted parts and casings including suction and delivery casing are made of stainless steel AISI 304 and 303. Pumps are suitable for pumping water in Industries, Cooling systems, Aqua farming, Water treatment, Circulation of hot Water, Pumps on Water Treatment Plants, RO, DM Water Plants, Marine Water Handling, Fertilizing - metering & dosing applications. Head max up to 230 M.
Temperature ranges of 0º C to +110º C.
Single mechanical seals very easy to interchange.